There’s a common belief that all learner drivers are in their late teens or early twenties. While the average age of new drivers is 26, in recent years this has been increasing, with more people learning and taking their driving test later in life. Many things put people off learning when they’re younger, such as further education, city living and the costs involved. In a lot of ways, learning to drive at an older age can be just as easy and hold some extra benefits. The highest percentage of driving test pass rates are among 17-year-olds and these generally fall as learners get older. Data from 2015 to 2016 shows that 17-year-olds had a pass rate of 56.7%, significantly greater than the 42.9% rate for 30-year-olds and 36.8% for 40-year-olds. One of the main factors that forces people in their 30s and 40s to learn to drive is necessity. Usually it’s due to relocating or getting a new job, which is inaccessible via public transport, or having children. The average cost of learning to drive is around £1,250, which includes your provisional licence, lessons, theory and driving test, and learner insurance for 30 days of practice. Then there’s the cost of your first car. Time: Having a full-time job will take up more time than school or university did but you’re probably much better at time management, especially if you have children. All those years of juggling swimming lessons, football practice and family meals will stand you in good stead for finding the time for lessons each week. If you arrange driving lessons for after work has the added bonus of a ‘free’ ride home. Cost: Hopefully your finances will be greater and in a better state in your 30s and 40s, so you can budget for all the essential costs. Affording to learn to drive should be a lot easier. Determination: Many teenagers will of course be highly determined and everyone wants to pass their test first time. However, for those learning to drive in their 30s and 40s, when passing is necessary to get to their new job it can add that extra drive. For those learning to drive in their 30s and 40s, the same considerations must be taken into account as for any new driver. However, the choices made may differ slightly to suit older learners. Car insurance can be the highest cost, especially after paying for lessons. 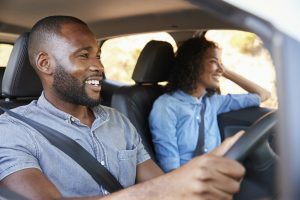 The good news for those in their 30s and 40s is that despite being a new driver, premiums are almost always lower for older drivers (especially compared to those under 21). There are some insurers who simply don’t like new drivers though, so it’s worth scouting around for the best deals. Telematics insurance, where a black box is fitted to your car that tracks your movement, how long you drive for, acceleration and braking, can further lower the cost. The AA Driving School offers a referral for such an option. You’ll also need to think about what you want as your first car. It can be worth buying one before passing your test to practise in (as long as someone who’s held a licence for over three years and is over 21 is sat beside you). Most first car recommendations are aimed at young drivers on a tight budget. While affordability is still important, you may have extra cash to spend and other priorities aside from just cost. If you have a family or executive job, think about what would suit your needs best, while still keeping the costs of your first car low by opting for a quality used car. Learning to drive in your 30s and 40s shouldn’t be a daunting task and there’s no reason why you can’t pass your driving test first time either.